Orange County Personal Injury Lawyer >> Blog >> Rear-End Collision Fault: If You Rear-End Someone Is It Always Your Fault? Rear-End Collision Fault: If You Rear-End Someone Is It Always Your Fault? When it comes to rear-end accidents, most people assume that the guy in back is always at fault. But the truth is, that’s not always be the case. Both the rear driver and lead driver could be cause of a rear-end crash, and determining liability depends on a variety of factors. Below, we explain what factors determine rear-end collision fault, and what you should do if you were involved in a rear-end accident. To learn more about how to determine fault in a car accident, contact Russell & Lazarus APC today. When Does Rear-End Collision Fault Fall on the Rear Driver? Fault in rear-end collisions isn’t automatic. For example, let’s say you rear-ended someone, but there were factors beyond your control that contributed to the accident. The driver in front of you may have stopped short, or you tried to stop but your brakes wouldn’t work, or there was ice on the road. Whatever the case may be, if you took the proper precautions to avoid the accident, the court may find you only partially at fault for the accident. Your lack of exercising proper standard of care caused the accident. The accident caused damage either to the vehicle and/or to anyone inside of it. When Does Rear-End Collision Fault Fall on the Lead Driver? In the above scenarios, it’s possible that despite having adequate distance between both vehicles, the rear driver wasn’t able stop in time. So what can you do if you were involved in a rear-end car accident? Pure comparative negligence comes into play in rear-end collision situations in which both parties did not exercise an adequate level of care. How much fault each party had in the accident determines liability. For instance, if you rear-ended a vehicle because the lead driver stopped short, you may only be 60% liable for the accident. The other driver may be 40% liable. If the other driver has $10,000 in damages, he can only collect 60% of that amount or $6,000. In turn, if you have $5,000 in damages, you may only collect 40% of that amount from him. It’s possible to reduce your liability in a rear-end collision case, but it’s not easy. You must prove the other driver was at fault for it as much as you or more than you were for the accident. Many people believe they can handle an accident case on their own, or they decide to let the insurance company deal with it. This isn’t in your best interest. It’s imperative to gather enough evidence against the other driver to show he was negligent to reduce your liability. It can be difficult to do this when you don’t know exactly what you need to show the court. In addition, insurance companies only consider their best interests. They simply want to save money and pay out as little money as possible, which may not always align in what you need for your case. That’s why it’s important to have an experienced car accident attorney on your side. 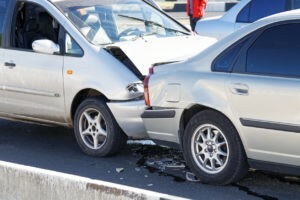 An Orange County car accident lawyer can help you determine how to establish rear-end collision fault, as well as inform you of your options. Contact Russell & Lazarus APC today to learn more.